Infinite Loops: Depression, Stuckness, Grief, and Self-preservation. In the past six months or so I’ve done a good bit of coloring. I’ve found time for Hardanger embroidery. I’ve read a dozen or more books (I’m a slow reader), countless internet articles, and comics out the wazoo. I’ve developed a healthy daily yoga habit, learned to cook my lunch (actual cooking) almost every weekday, and while I don’t sleep well at night, I often make up the time the next day. I’ve critiqued the work of other writers (at their request, though I’m behind on that) and submitted (had rejected) two short stories. 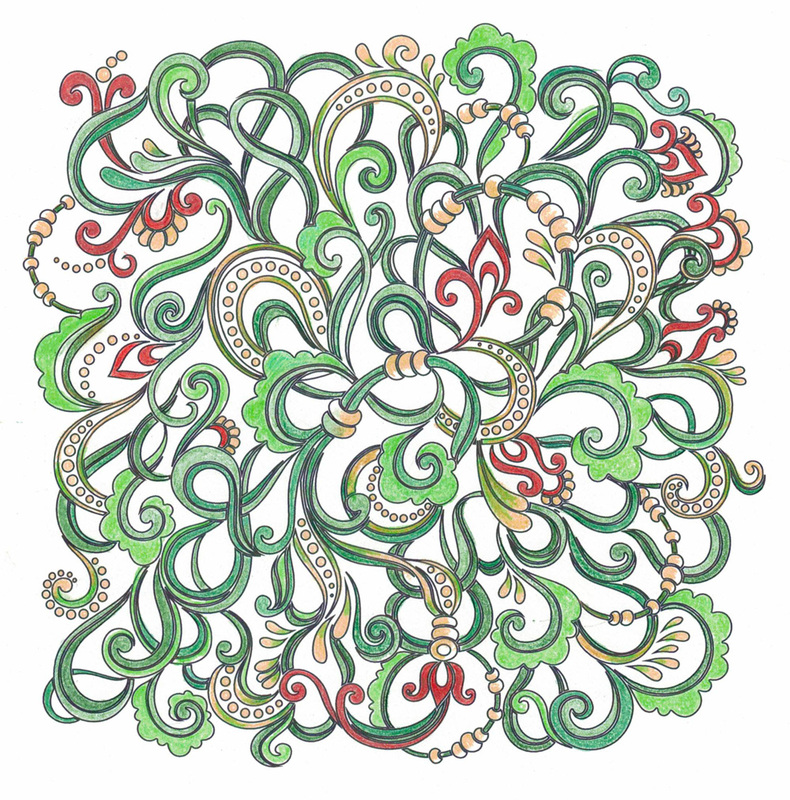 I’ve even attempted Zentangle—there was nothing Zen about it for me. What I haven’t done is make any significant progress on my novel. I don’t intend this post to be a whine fest – merely observation. Every effort to write a blog post, personal letter, notes on The Book, journal entry, etc., has been a lengthy probe into what part writerly fear, grief, clinical depression, and rage play in my lack of progress. If X is true, then do Y, where X is always true. Here’s a simple DOS version. When you are using software and it “hangs up” and you have to shut down your computer or give it the ol’ “three finger salute,” you have probably stumbled on an infinite loop. So here I am at :A, where :A equals me relentlessly and ineffectually sorting out my lack of motivation. I have, in the last few days, “set an intention” during my yoga sessions to be kind to myself. To stop beating myself up because of my perceived failures. It’s hard. I’ve been beating myself up since childhood. I’m an expert at emotional masochism. Yet somehow, I must find a way to both release myself from the stranglehold of obligation and revive my desire to write at the same time. I can only guess that not hating myself for what I haven’t done is at least one place to begin. My title to this blog post is misleading in a way. I did not at all tackle the subjects of depression, stuckness, or even grief. I’ve mentioned them only because they exist here in this loop from which I am trying to break free. In acknowledging them, I hope to get to the self-preservation that my subconscious thinks the loop is providing but is, in fact, chipping away with each iteration. That self-preservation is, is it not, what the writing is for? Rather than letting the loop determine how I will conquer the depression, stuckness, and grief, the pen must rip through that loop and conquer them for me. This entry was posted in Thoughts on Writing and tagged block, coloring, depression, grief, infinite while loop, Thoughts on Writing, yoga on September 16, 2015 by K. C. Dockal.